The Shiosai Bridge in Shizuoka, Japan, is a prestressed concrete four-span stress-ribbon bridge with roadwayslab decks, which forms a so-called inverted suspension bridge. The bridge, for cyclists and pedestrians, was completed in 1995. The superstructure consists of roadway slab decks, columns which support the slab decks, and stress ribbons forming the lower cord. The bridge length is 232 m, the clear width is 3.0 m, and the span lengths are 55, 61, 61 and 55 m.
In this structure, loads are transferred via the slab decks into the columns, which are supported by the stress ribbons that in turn are supported by the piers and abutments. 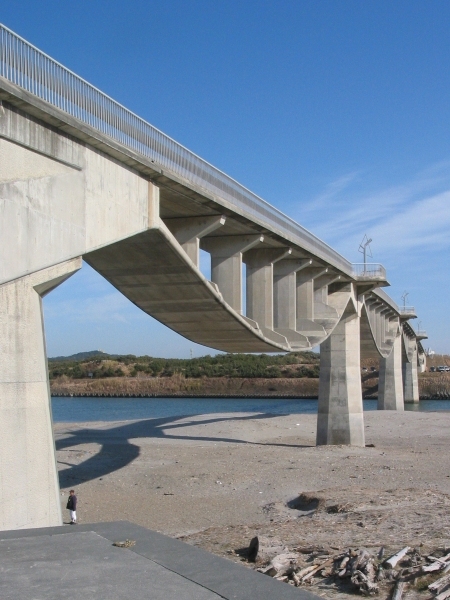 Overall stiffness was increased using elastic connections with horizontal neoprene bearings, which were installed between the ends of the roadway slabs and the abutments. Most of the superstructures were precast using lightweight concrete, in order to minimize the horizontal forces acting on the abutments, thus making the structure more economical. To ensure corrosion protection, epoxy-coated prestressing strands were used for bearing cables and prestressing cables for the stress ribbon.